Our Garden Suites offer views of The Inn's gardens and commons and are located on the second and third floor. 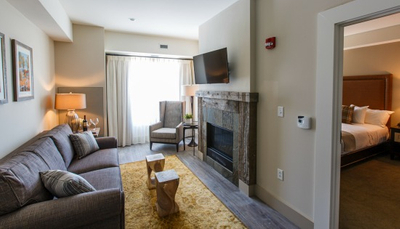 Our rustic, contemporary, chic inspired interior includes a spacious layout featuring a separate king bedded sleeping room coupled with a sitting area featuring a pull out queen sofa bed. The sitting area offers a fireplace and small dining nook. 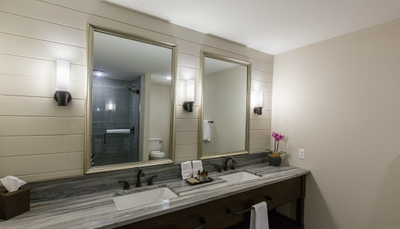 A luxurious modern bathroom with a double vanity, European bath essentials and bath linens. 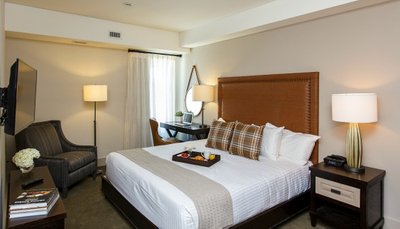 Guests can enjoy in room coffee service, under counter refrigerator and wet bar.